The blocks for my newest pattern, Nature Sweet, are finally ready! I should be stitching them together tomorrow. The fabrics are so cute! Butterflies, bugs, and blossoms in this fun collection called Perch by Dear Stella. The pinwheels were easily made using the Strip Tube Ruler, which has become my most favorite method of making HSTs. I just have to look up at the table to find out the width of the strips I need to sew together as a tube, then place ruler on the stitching line and cut, press, trim ears. Two straight stitching lines on the strip set is all it takes. The photos I took while assembling the blocks will be featured in the instructions to make the pattern easy to follow and the blocks fast to put together. 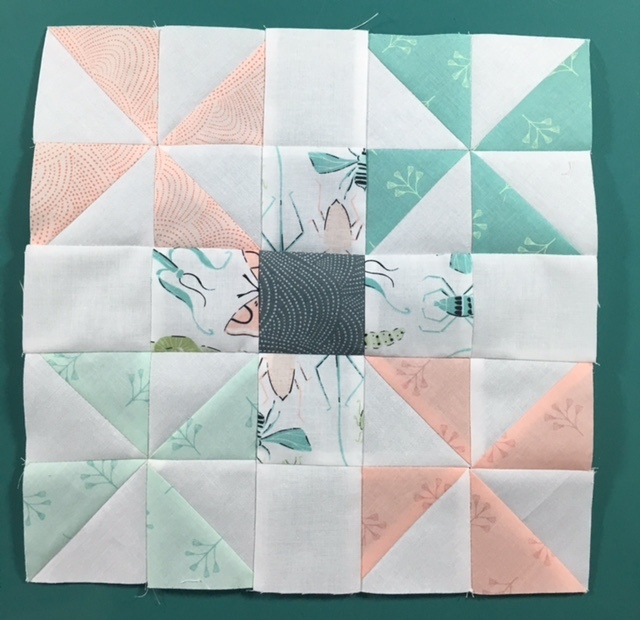 I am thinking that these blocks would also look great using ombre' fabrics. I will save that idea for when I make this quilt again. The pattern will likely be available as PDF for download next week on Etsy store (Quilterly). Progress despite two days with migraines. Yeah!